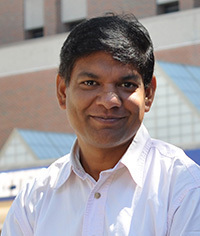 Dr. Pattnaik is primarily interested in understanding mechanisms of retinal diseases due to ion channelopathy. Ion channels are cell membrane proteins facilitating passage of selective ions into or out of the cell and hence are integral to cellular communications. His lab uses both heterologous system and retina cells to determine the function and dysfunction of potassium and chloride channels. Retina Pigment Epithelium (RPE) supports the ability to see by regulating function of the neural retina. They are studying mutations within the RPE potassium (Fig.1) and chloride channels that cause Lebers Congenital Amaurosis (LCA16) and Best’s disease respectively. The lab is also working on a second project to study retinopathy of prematurity (ROP). ROP is a developmental disorder associated with abnormal blood vessel development in the retina of the eye in a premature infant. It can be attributed to exposure of a developing fetus to a variety of altered maternal system functions necessary for the onset of parturition. They are interested in determining if maternal system failure contributes to developmental vision disorder like ROP. Recently, the lab discovered that oxytocin, a birth hormone, is present in the human photoreceptors and oxytocin receptor is present in the adjacent RPE cells (Fig. 2). This implies that release of oxytocin from the retina photoreceptor will activate the RPE oxytocin receptor to initiate a signaling cascade. They are studying this mode of communication between the PR-RPE in the context of retina development and function. The lab uses an approach of cell, tissue, organ, and organism to develop novel therapy. Various techniques adopted by the laboratory are patch-clamp electrophysiology, electroretinogram, live-cell fluorescence imaging, biochemical assays and molecular biology assays. Feedback, questions or accessibility issues: chaim@wisc.edu.